A little Tuscan delight! A real italian dessert that I really love. It'll be after dinner pleaser. Cut the Panettone in small cubes. Put the butter in a small pan and melt it over low heat. Remove from the heat and stir in the sugar, cocoa and flour. Blend in 2 tbsp. cold milk, beating constantly to obtain a smooth cream without lumps. Mix in the remaining milk, place the pan over low heat and add salt. Stir constantly as the cream thickens. Let the mixture boil a minute or two, then remove it from the heat. Pour the mixture into a large bowl, mix in the Panettone cubes and sprinkle with the orange liqueur. Put the bowl in a larger container filled with ice cubes. As the pudding cools, stir occasionally. 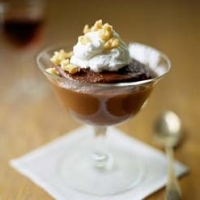 Divide the pudding among 6 dessert cups and refrigerate them for at least one hour before serving. Serve with Whipped cream and nuts if so desired. Like smooch's recipes? Never miss an upload!